English: The control unit of the Yamaha Disklavier Mark III. This picture shows one component of the Yamaha Disklavier player piano. 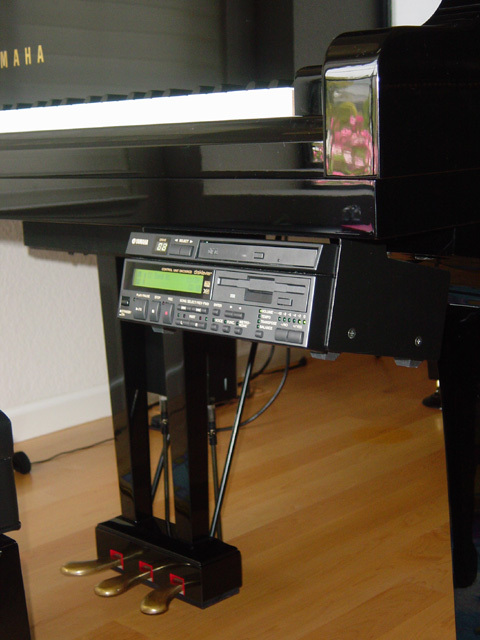 The unit mounted under the keyboard of the piano can play MIDI or audio software on its CD or floppy disk drive. Songs can be recorded/transferred to one of the 16 memory drives each has the equivalent capacity of one floppy disk. 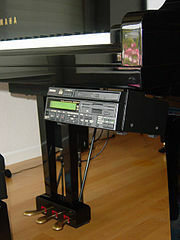 CD drive; floppy disk drive; control cluster for volume, tempo, transposition, balance; button cluster for function, voice selection, cursor control; song selection; left/right hand part selection; play/stop/pause buttons; power button; LCD display; disk drives indicator and selection button. On the back of the unit are MIDI in/out ports and computer serial interface connections. Most components of the system are out of sight. Other components include a row of solenoids and optical sensors mounted behind each and every piano key, the synthesizer for other non-piano MIDI voices, amplifier and two speakers mounted under the sound board.